Swami's Hospital wards are suffused with compassion flowing from the hard working staff and sweet examples of how the needy patients are helped in so many ways. Yet, often times, this flow reverses and the givers find themselves receiving from these springs of ever-streaming love. Here is one such tale about an innocent, pure hearted 'embodiment of love' which a staff member at the hospital has beautifully recorded in his diary. Today I met a Teacher who taught me unquestioning faith in God. This did not happen in a classroom, there was no bespectacled professor, nor were there any clever arguments being exchanged. 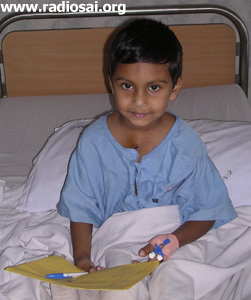 I was taught Faith in the Hospital ward through the little index finger of a 5-year old child. I went to the Cardiac post-operative ward this evening to look up the 'little VIPs', recovering from surgery. There were children of different natures. Here was one blissfully asleep, there was one playfully snuggling in its mother's lap, and there one more who was doling out toothless grins to whoever caught its eye. And then there was my Teacher, who was very busy with a pen and paper. I gently walked up to her bed and peered over to see what she was doing. 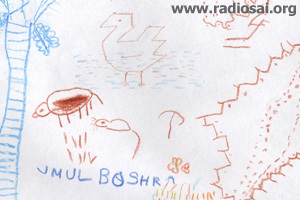 She was doodling away - coconut trees, birds, cows, rivers and all other 'childish' stuff. 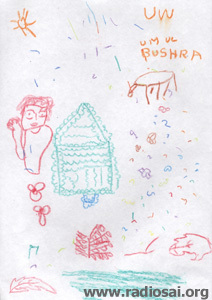 But I might as well admit now, rather than later, that Umul Bushra was no ordinary child. She looked up, smiled and continued her drawing. From the time of her birth when she had been having spells of unconsciousness till the time she came to Swami's Hospital, Umul had been through a long period of pain and desperation. Her father, Abdul Rehman, runs a public telephone booth in a remote village in interior Karnataka. 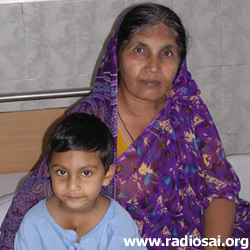 A little prodding, and he and his mother, whom Umul is very attached to, reel out the story of how Umul was diagnosed as suffering from a heart disorder and how through a devotee doctor they came to Swami's Hospital and how after a 4 year wait, Umul underwent a successful operation and is now recovering in the ward. "We used to treat Umul like a delicate flower. Because of her heart condition we never used to let her walk. We used to carry her to the school and let her stay there only for two hours lest she strain herself or hurt herself in the games. 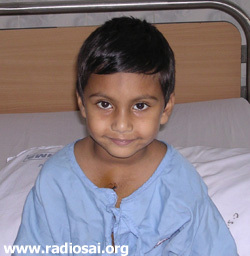 We were so concerned about her future and are now so grateful to Swami's Hospital. Never have we seen or experienced anything like this before," they said. 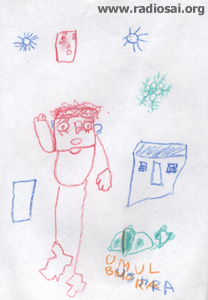 While we conversed, Umul continued her doodling, stopping once in a while, only to look at her creation from a distance. She stopped doodling and lifted her hand along with her IV line and pointed her index finger at something on the wall. I must be one of those slow learners for I gazed in that direction, but I did not register what she was pointing at. My Teacher realized this. If a child could give a compassionate look to a slow learner she gave me one such look and uttered two syllables in her sweet voice, "BA BA". They came straight from her heart spontaneously, with no ambiguity, no second thoughts and no hesitation. It was only then it dawned on me that she was pointing to Swami's picture on the wall! Neither Umul nor her parents have even seen Swami, but it was so touching to see how effortlessly they have accepted Him in their lives and live with such simple faith that He is there to take care. I was so moved by the reply from my young teacher. Feeling too shy to thank her, I smiled at her, said 'Sai Ram' (which she reciprocated in her sweet voice) and took her leave. And here I am, back home to tell you what I learnt in the 'school of our hospital ward' today?